Summer in New York City can be brutal to your skin. It’s hot, humid, and the air is full of dust and grime. 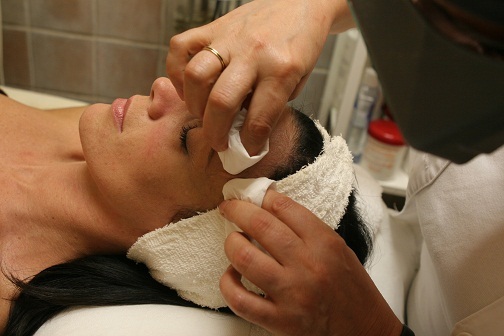 The Deep Pore Cleansing Facial at Dyanna Spa in Manhattan is the perfect skin care solution. Whether you have whiteheads, blackheads, oily skin, skin that is prone to acne, or just want a skin refresh, our advanced facial cleansing treatment is the answer. After the facial cleansing and pore extrapolation, our aesthetician applies a wonderfully soothing facial mask that deeply moisturizes and revives the skin. The facial mask used depends upon your skin type. The facial mask continues to draw out impurities from the skin, while tightening facial pores and refining the skin’s texture. The mask is removed with a relaxing warm soft towel. The final touch is the application of a deep soothing moisturizing with a sun block additive. Regular scheduled deep pore facial cleansing is important to the health, appearance, and vibrancy of your skin. When the skin is thoroughly cleansed, brand new cells can form, giving your face a youthful and healthy appearance. Voted as the best beauty spa and nail salon in New York, N.Y, Dyanna Spa’s Deep Pore Cleansing Facial will not only rejuvenate your skin making it softer and smoother, but it will leave you feeling refreshed and vibrant. It’s never too late to start caring for your skin. At Dyanna Spa, you receive top professional treatment at affordable rates. So don’t let N.Y.C.’s summer heat and air drag you down. Call us now at Dyanna Spa at (212) 995-2355 to make your appointment for a wonderful deep pore facial cleansing treatment. NYC’s top rated spa knows that this year the “IT” spa treatment is all about the girl from the block. No we’re not talking about your neighbor in 5B. The Queen of skin sheen herself, J.Lo, knows Placenta Facial Treatments are where it’s at when it comes to reversing signs of aging and restoring skin’s natural youthful glow. In case you haven’t been keeping up to date with the beauty trends of the moment, we don’t want to freak you out. Get that nasty little image out of your head – Placenta facials aren’t as disturbing as you think. Although you can count Madonna as one of the trend’s loyal fans, you shouldn’t worry about it involving any crazy new workout routine or switching out your tap for Holy water. Just 45 minutes of relaxation can get you looking young and fresh with this decadent facial spa treatment. It was just a few years ago, when word came to the US that woman in Asia were using baby placenta in skin creams as a preventative for onset signs of aging. Jennifer Lopez and husband Marc Anthony were among the first to speak out about their love for the super luxe treatment. Clearly everyone was dying to get the J.Lo glow because now, celebrities like Reese Witherspoon, Nicolette Sheridan, Mischa Barton, and Jacqueline Bissetto are addicted to this facial for SO MANY reasons! Here’s our top 3 Reasons why you should book one now! The International Clinic of Biological Regeneration claims that the idea of live cell therapy began in 1931 after a woman was revived from a near death experience through use of steer stem cells, the idea to inject face products with the same, active growth cells became clear. Today, most treatment creams are usually made from plant placenta or sheep placenta. “Placenta is rich in proteins and iron as well as a host of other vital nutrients.” explains nutritionist Susannah Lawson. The benefits the facial provides is almost endless; there are tons of vitamins, minerals, amino acids, more than a hundred kind of enzymes, including growth inducing insulin. It’s recommended to treat almost any skin problem from dull, uneven skin complexions, to eczema, psoriasis, acne, sun damage, and wrinkles or fine lines. The placenta facial can be used as an in between maintenance in addition to your regular facials, so adding on this luxe treatment can help keep skin clearer and more radiant in the long run. Because of the powerful nutrients found in the creams and masks made from placenta cells, just a small amount goes a long way! Longer lasting products = longer lasting paycheck ladies. Cream is usually massaged onto your face, including on the ear lobes and eyelids which are typically avoided during regular exfoliation and certain facials. Most treatments include a regular facial after the treatment of the placenta cream, so essentially you are able to get a TWO for ONE deal. Who in the world could pass that up?! Unless you’re just not interested in being as glowingly beautiful as some of your favorite celebrities, than we’ll be expecting your call within the hour! Make an appointment today for your star treatment.